Our condo offers luxurious furnishings, kitchen with granite countertops, hardwood floors, jetted tub, washer/dryer, flatscreen HDTVs (Showtime and HBO) in every room, a full service kitchen and more. Your vacation in our condo will feel like your home away from home. We are travelers ourselves, and one rule of thumb we keep is that wherever we stay should be at least as nice as where we live, which is why our condo in Park City is truly an escape away from it all! This is our second year at this excellent and truly ski-in, ski-out location. We highly recommend this very comfortable unit at the ski lift and on Main Street. The property was very nice and the experience of skiing into downtown Park City and then walking 20 feet to your lodge was amazing. Very nice property in a fantastic location. Very nice property. Super close to the town lift. Very clean and cozy. Has a keurig which isn’t mentioned in the description. Ski locker is convenient. Would definitely stay here again. Only potential issues are noise - upstairs unit was loud and street noise at night was loud but we travel with sound machines so wasn’t a problem. And light - both bedrooms face Main Street and only have shutter blinds so the bedrooms were very bright at night. Overall we were impressed with the property, location, and price for value. The place is as advertised - in the heart of town and true ski in/ski out. It was perfect layout for two couples (and one more on the sofa, if needed). We had a couple normal hiccups with washer and tv cable, but it got rectified quickly. - you can ride town lift up and down the mountain. Beginners should ride it down as the slopes coming in are somewhat steep and narrow for a beginner. Intermediates will be fine. - you are just above street level so you will have some noise from people passing by at night. It’s not really bad, but it’s there. If they get a lot of snow (like we did) you WILL hear them plowing and moving snow. - washer/dryer are a little small so you’ll have to do many small loads. - High West Distillary is great, but get there early as it gets crowded. - lots of restaurants within very, very easy walk. - it’s somewhat expensive to eat and shop so just be aware of that, too. You’ll have a great time here. If you are skiing or snowboarding you can not get any more convenient. I loved this place!! Checking in couldn’t have been any easier. The coded doors are so nice. The condo is decorated adorable and is very homey beds are comfy . When we come back year I really hope this place is available. I can can’t say enough nice things about my experience. Great location - right at the town lift. Right on Main Street with access to lots of great restaurants and shopping. Cant beat the convenience! 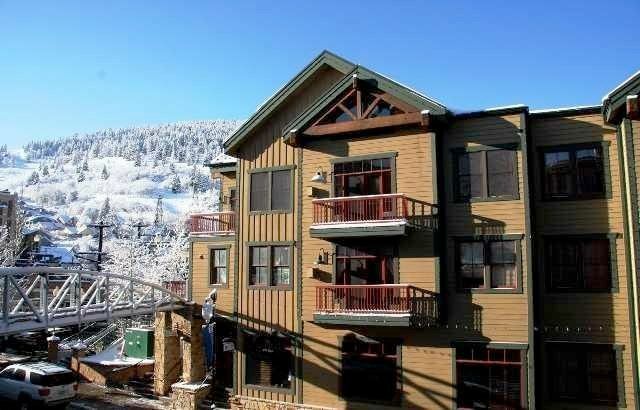 Located in the absolute best location in downtown Old Town Park City, Utah! Literally steps away from the best of both worlds: 5-star dining in Park City and a Park City ski lift that whisks you up to one of the best Mountain Resorts in the world, Park City. Located on the free shuttle route. Shuttle bus can take you to Deer Valley Resort (5 minutes away), The Canyons Ski Resort (10-minutes away), Outlet Shopping Center, and almost anywhere you'll need/want to go! Park City is conveniently located approx. 30 minutes away from Salt Lake City International Airport - Leave LA or NY in the morning and be on the slopes in the afternoon! Ski: SKI Magazine ranks the two closest resorts Deer Valley #1 and Park City #4. Deer Valley is just a short shuttle away - steps from the door and Park City is ski on/off with the Town Lift mere footsteps from your door. The Canyons Resort is a short shuttle ride away while Solitude, Bright, Snowbird and Alta are also accessible.